In the age of development of sports gadgets and mobile applications, to lead a healthy lifestyle without using gadgets is even somehow strange, and why, if there are sleep analyzers and electronic pedometers, and applications that say when you should drink water? This, of course, is a joke, and to wear sneakers on time, you do not need anything but desire, but with the help of special programs, you can really simplify many things. For example, to keep a diary of a food not in a notebook and not in Excel, but in the convenient application. Maybe you want to get rid of any bad habit? Have you got any? So, some applications will help you in this way too. 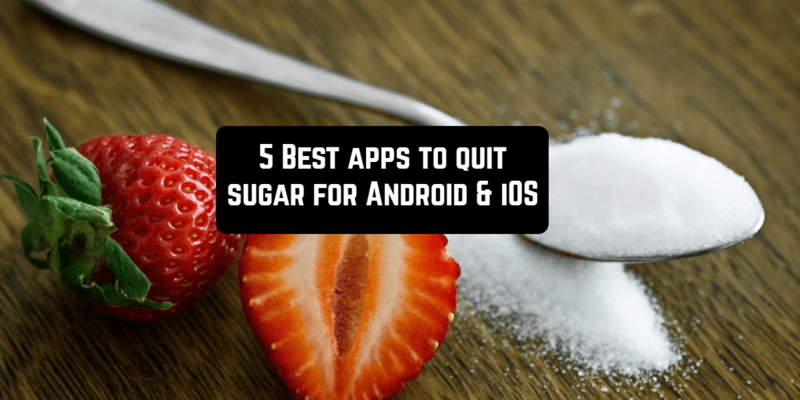 In this post, we’d like to tell you about how to quit sugar with the help of mobile apps. Have a look! MyFitnessPal is the easiest and most convenient calorie counter. The largest calorie counting food database, containing more than 4,000,000 titles, and an incredibly fast input of nutrition and exercise data will help you lose those extra pounds! The best app for tracking your diet. MyFitnessPal is not just a calorie counter, but a whole sports community, the tools of the program are used by 65 million people, and you can download applications for iOS or Android, and you can free to keep your diary on the web. First, you need to tell the program how much you weigh, what weight you are striving for, with what intensity you will go to the goal, what your way of life is. So, with a weight of 65 kg and a height of 170, the application will advise you to eat no more than 1420 calories per day, if you move a little. Half of the diet should be carbohydrates, 20% – proteins and 30% – fats. You can also put yourself other fitness goals. Some of these settings already inspire a new life. For example, you can set yourself the goal to quit eating sugar and strive for it using MyFitnessPal. As for most people, this is the main problem. After all, sweet foods are very caloric. By the way, very few people thought that a small piece of a cake with cream contains almost daily calorie rate… Very few people regulate the number of sweet in their diet. And if someone regulates, then without any system, so intuitively … However, the one who really cares about his health should thoroughly understand this issue. This application can become your assistant in this matter. You can invite your friends to follow your achievements together and encourage each other! It is difficult to make such a step as to quit sugar. However, you have a chance to do it if you’ll try Quit Sugar app! This app has a program for setting and tracking your sugar quit and reduction goals. It will be easier to overcome sugar addiction as Quit Sugar contains useful information about sugar consumption and helpful ideas. The app itself will not track your sugar consumption content, it tracks your success in fulfilling your quit or reduction goals. There is a special list of different quit categories. You should choose one or if you haven’t found the needed one you can add your own. One interesting feature of this app is 8 WEEK CHALLENGE where you can arrange your quit goals according to the algorithm across the 8 weeks. Every day you will see reminders to record your progress. It is easy and simple. You can view the history in graph form what allows you to track what you were quitting each day and what is your progress. There is a green color for goals which were achieved, amber – for improved ones, red – for your failure. Quit Sugar also allows tracking your mood. It is also done with traffic light system. Green – for good mood, amber – for average, red – for bad. So, you will see how your mood changes with reducing your sugar addiction. You will see how it improves and stabilizes. The same for tracking your weight. This function is also available. Using Quit Sugar will help you not only to track sugar consumption but you will get a lot of useful info about how much sugar is found in everyday food. It will motivate you to achieve your goals moving to a more healthy lifestyle. Yes, sugar is very similar to drugs in many respects. And if you still doubt, then try to abandon it for a while. When we absorb the sweet, we get an immediate injection of dopamine and then experience a sense of pleasure. If we are deprived of this for a while, then we become often capricious and irritable. We can experience even such symptoms as a headache, nervousness, even refuse from your favorite food, if it does not have sugar. It is a substance that can not be resisted, although many of us understand the consequences of its consumption. 7 Day Sugar-Free Detox can assist you if you have decided to quit sugar. Here you will find to plans from which you should make a choice. One of them is Low-Sugar Meal Plan. It offers small amounts of natural sugar found mostly in fruits. Another meal plan is No-Sugar one. It is a completely sugar-free plan. Using the 7 Day SSugar-FreeDetox you will also find such useful information as recipes – along with a list of health benefits for each recipe, Young and Raw’s favorite books, quotes & documentaries, frequently asked questions. The 7 Day Sugar-Free Detox was carefully crafted by experts to get you results while maintaining your sanity throughout the process! Meanwhile, the danger of excessive consumption of sugar is far beyond the well-known cliche “you will eat a lot of sweet – you will spoil your teeth”. Problems with excess weight and obesity, a disorder in the mechanism of the insulin apparatus of the pancreas, an increase in the cholesterol in the blood, the creation of conditions for the rapid development of atherosclerosis, the excretion of calcium and other minerals, the depletion of the protein stock – the list can go on and on. The thing is that sugar is only carbohydrates and nothing but them. So, on the way to combat with sugar dependence, you can try Quit That! application. It is a simple tool which helps you to track the stuff you are trying to quit. It has a clear and modern interface, so working with this app will be pleasant for you. You can track not only sugar quit but as many things as you want. Quit That! will help you to improve your life and make it healthier. You can share you progress with others if you wish or keep it private. The app is available only for iPhone users. This app will help you to cope with such problem. No More! is an elegant and helpful assistant that supports you daily in overcoming any addiction which is holding you back from becoming a better person. The app contains a lot of useful features that will help you to overcome bad habits. You will see your progress and it is possible to share it. You can read various quotes that will motivate you to move to your goals. You can set up your customizable in-app shortcuts to instantly access any website, online community or call a trusted person. You can set a password to lock/unlock the app. To get rid of cravings for sweets and break the cycle of dependence on carbohydrates that harm our health, we need to arm ourselves with a clear plan of detoxification from sugar. To successfully implement it, try No More! Agree, there is not so much to do for the beginning of a qualitatively new healthy life, which, undoubtedly, soon will please you with visual and positive results. Good luck in your new life without sugar! This will surely help you live longer, avoid disease, be more energetic and feel much healthier in general. If you set a goal to lose a little weight and burn a couple of calories, but there is a problem with the lack of time for additional training, please do not be discouraged! And this is because “someone” else will take care of your weight! Here you will find a selection of 15 best weight loss apps for iPhone & Android, which are aimed at weight reduction.